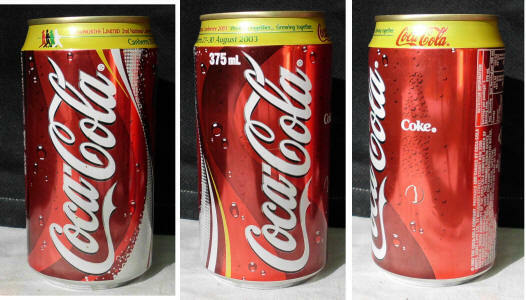 Special Single CocaCola Cans !!! 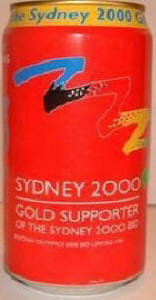 (01) 1993/1994: "50Cents donated to the Sydney 2000: Games Bid!". 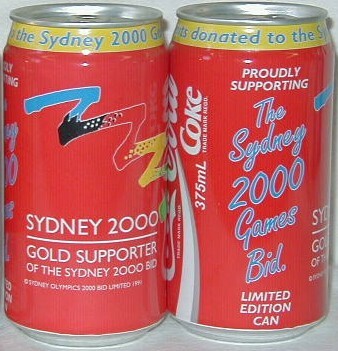 The can has been released when Sydney won the bid to host the olympic games. 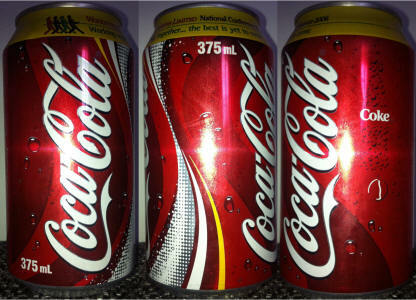 This 370ml cans were only produced in Sydney from 1976 to 1983. 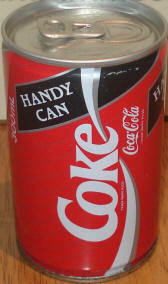 (03) This can is produced for the Japanese market, the can was filled in the Dandenong Coke plant here in Melbourne. 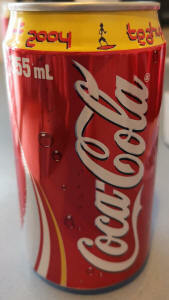 The odd feature of this can is that is 355ml, and all current cans in Australia are 375ml. 375ml cans) but about 50-100 cans survived. The majority was then sent to Japan, god knows was have happen to them after that!! But a hand full of can have been smuggled out of the factory. 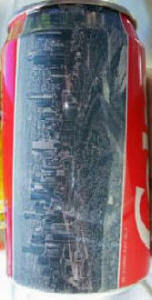 The can features a aerial photograph of the beautiful city of Melbourne, and is has text in English and Japanese. the Dandenong factory of Containers Packaging". (04) 2002: "Woolworths Limited 1st National Conference". On the side of the can it says: "Working together... Look what we can do!". (05) 2003: "Woolworths Limited 2st National Conference". On the side of the can it says: "Working together... Growing together". (06) 2006: "Woolworths Limited National Conference". On the side of the can it says: "Working together... The best is yet to come". (07) 2008 "Woolworths Conference". On the side of the can it says: "Woolworths Limited. Opportunities Unlimited conference". This can was released for the Woolworths National Conference. First edition in the 2002 in Canberra and last edition in the 2008 in Brisbane. You are not able to buy this can from any shop. You had to be there to get one and carefull to sneak one out. There were only 5000 cans, one for each 5000 delegates at the conference. 1 can per person on the table as you sat down. (08) This can is a real mystery. Its a strange size of 300ml, which wasn't used after this can. (09) "LOVE" can: Australia is currently participating in a postal survey on marriage equality. 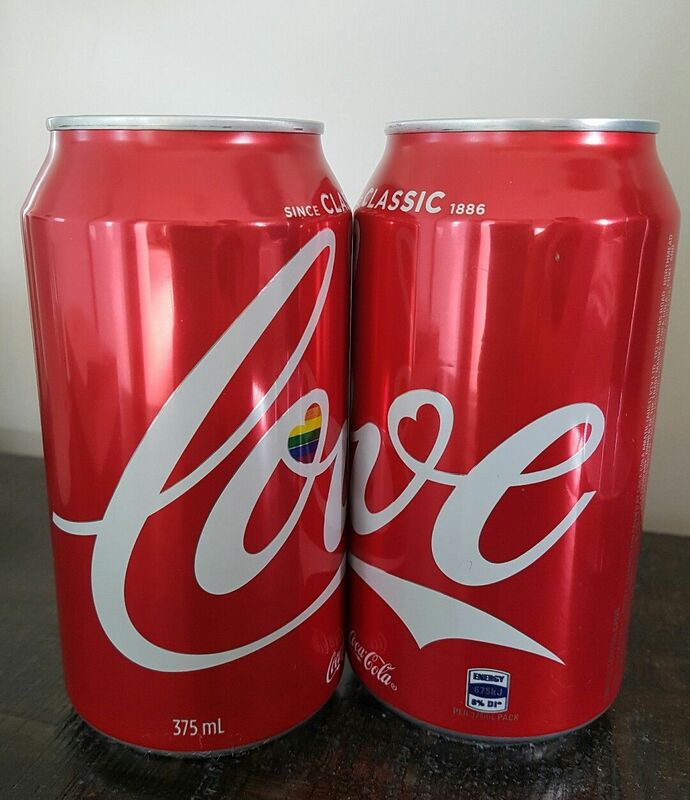 Coca-Cola has long believed in the power of bringing people together. No matter who you are or who you love, all couples should be treated equally. To coincide with the start of the postal survey, the team transformed the iconic Kings Cross sign and released a limited run of special edition cans emblazoned with the word, LOVE. (11) In New Zealand There is a large music gatherings which are free entry to all at Christmas time. They are called 'Christmas in the park' and thousands attend, and famous NZ performers sing their songs and many Christmas carols. For that year Coca Cola put out a "Green Christmas can" to advertise the events throughout New Zealand. Then, on the night, they released a special "Black Christmas can" which was only available at the park in Auckland. The can is, as a result, very rare. 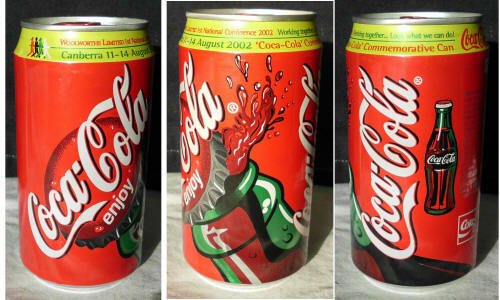 (12) 2000: New Zealand bottle can with a special CONVENTION sticker. It is a can specialy released for the CBCCCC can convention in 2000. Note that this is a sticker label on the can. 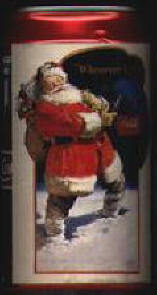 (13) 1998: New Zealand bottle can with a special Christmas sticker. ("Wherever I go" Santa holding Coke bottle). 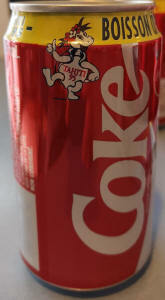 This was only available at the NZ Coca-Cola Collectors Club Christmas meeting. 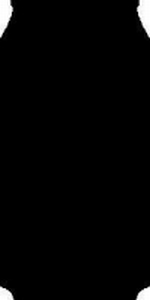 (19) 1995 Jeux Du Pacifique from Tahiti.